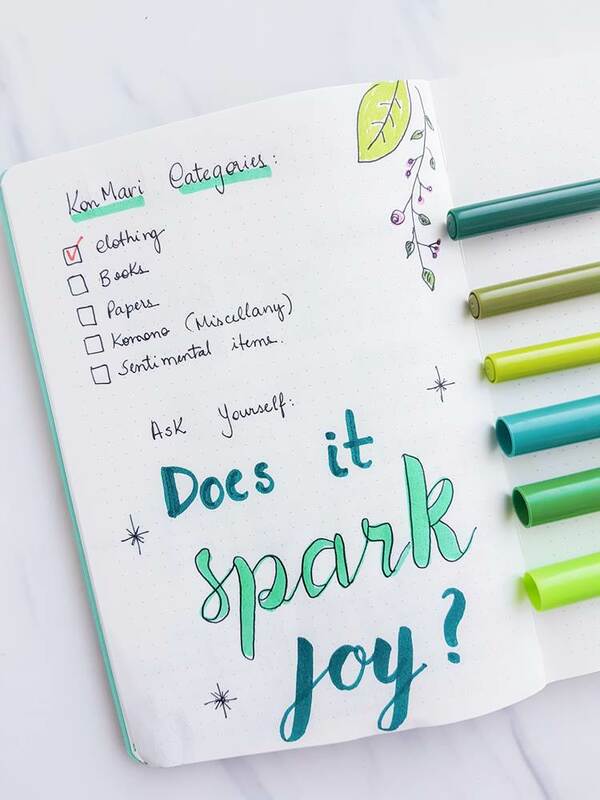 Learn how to use the Konmari Checklist for bullet journal and declutter your life! 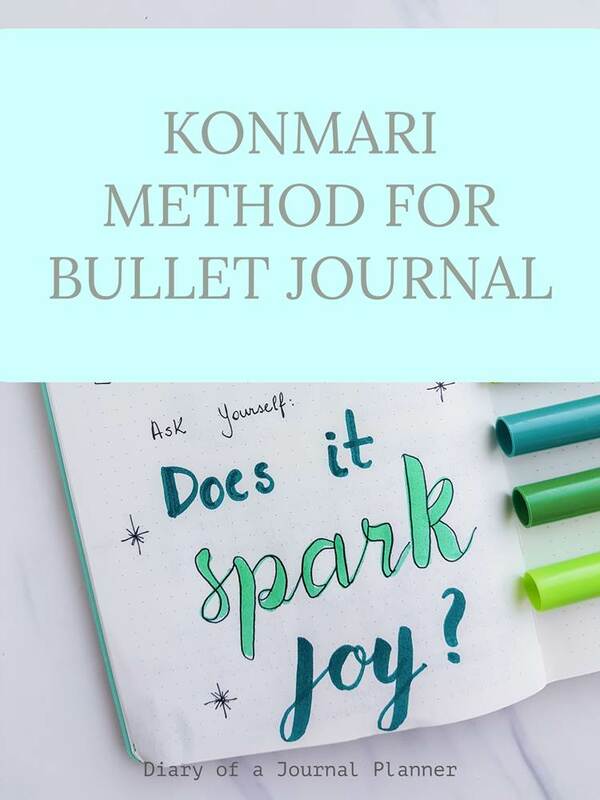 Copy my Konmari checklist bullet journal spread or download your free Konmari checklist pdf. 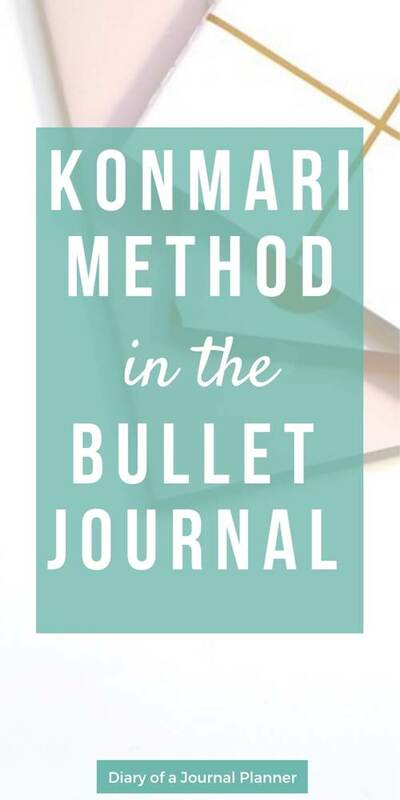 If you like to use the KonMari method to get your life organized then it makes total sense to use it together with bullet journaling. 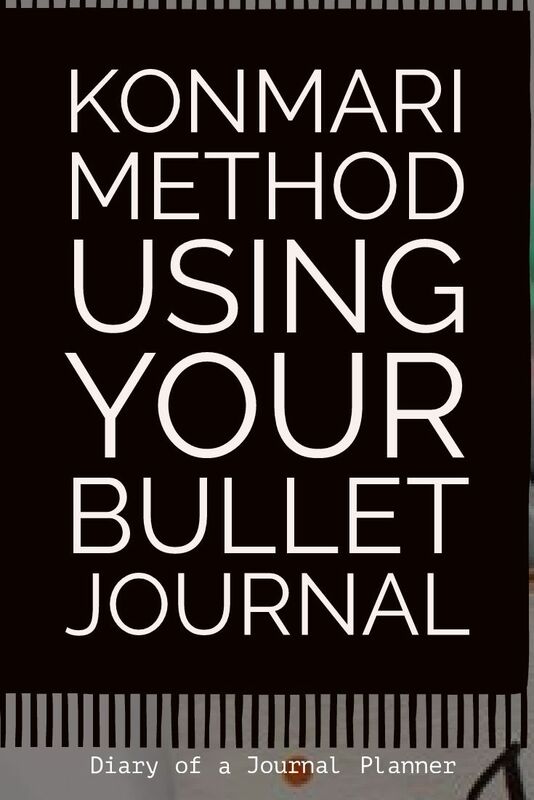 The bullet journal is a great tool to get you organized as well. Inside it you can track your habits, schedule lists, along with thoughts, ideas, goals, and so much more. If you are like me and love the book “The Life-Changing Magic of Tidying Up: The Japanese Art of Decluttering and Organizing” by author Marie Kondo, then read on! 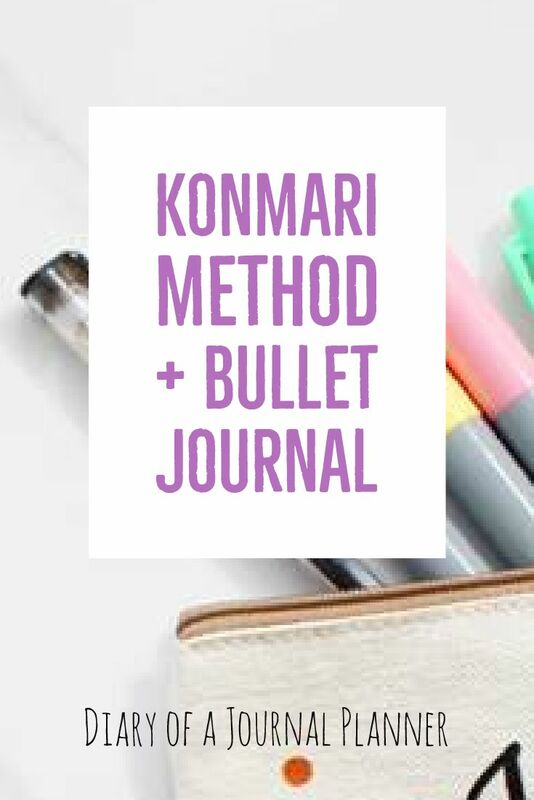 I am going to show you how to use the Bullet Journal Checklist for the Konmari method. 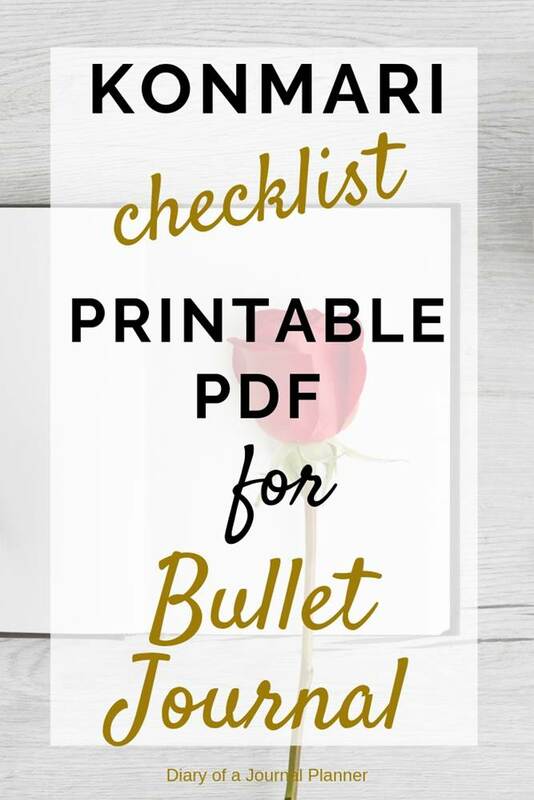 Below you will also find a bullet journal printable version! 1. What is a Konmari Checklist? Let me first give you a little introduction about this method which is explained in depth in the book “The Life-Changing Magic of Tidying Up: The Japanese Art of Decluttering and Organizing”. This summary is not intended as a replacement for the original book, all info is credited to the author and publisher of the book. Please purchase your book here. Konmari method is just a shorter term used to refer to this book. Basically the book explains the importance of decluttering your home and your life along with some step by step system for doing it. The emphasis of the Konmari organization method is deciding what to keep or discard based on your emotional attachment to a certain item. The author explains that as you reduce your possessions, and discarding the un-essential, you will reach a state that brings comfort. That state is different to each person. You will know when you reach that point where you have enough to feel happy and comfortable. As a very simple explanation, the method follows these rules below. This summary is not intended as a replacement for the original book, all info is credited to the author and publisher of the book. Please purchase your book here or read Marie Kondo blog for more info. According to Kondo when you store things out of sight inside boxes or cupboards, you are not decluttering, you are just creating an illusion of decluttering. Once the storage is overloaded you will have to face a much bigger task. So start by discarding, then you can truly tidy! Kondo explains that the best way to choose what to get rid of and what to keep is picking each item in your hand and asking the question “Does this spark joy?”. If it does, you keep it. If it doesn’t then discard it immediately. Once you have practiced discarding you will be able to understand and identify easily which items aren’t bringing you joy anymore. The author explains that you should know straight away as you touch an item if it sparks joy or not. Follow the right order and category of things for discarding and tyding. Kondo recommends that you gather all items of the same category before you decide what you will discard or keep. Lay them out on the floor and analyze them together. For instance, let’s pick the category clothes. Lay each item of clothing onto the floor (making sure everything is there included the clothes on the laundry basket), pick each one and identify which ones to keep or discard. Starting with an easier category like clothing will get you in the mood for decluttering and give you enough practice for when you reach the category that is the hardest to part with, the sentimental possessions. Kondo’s approach to organizing your belongings is simple: keep things of same category together. For clothes, don’t separate them by seasons, just follow a heavy to light arrangement in your wardrobe and drawers. Also fold your clothing standing up rather than laying flat so that at a single glance you can see each item. If you arrange them flat you can’t see the items at the bottom of a drawer. Keep your book and paper collection small. Discard everything unless it falls into one of three categories: currently in use, needed for a limited period of time, or must be kept indefinitely. Go through your miscellaneous items by category too. If they don’t spark any joy, discard them immediately. Below I will show you how to use a Marie Kondo checklist to assist you in tyding. 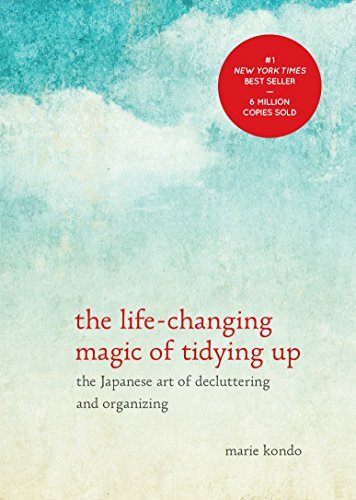 Purchase now the book “The Life-Changing Magic of Tidying Up: The Japanese Art of Decluttering and Organizing” on Amazon! 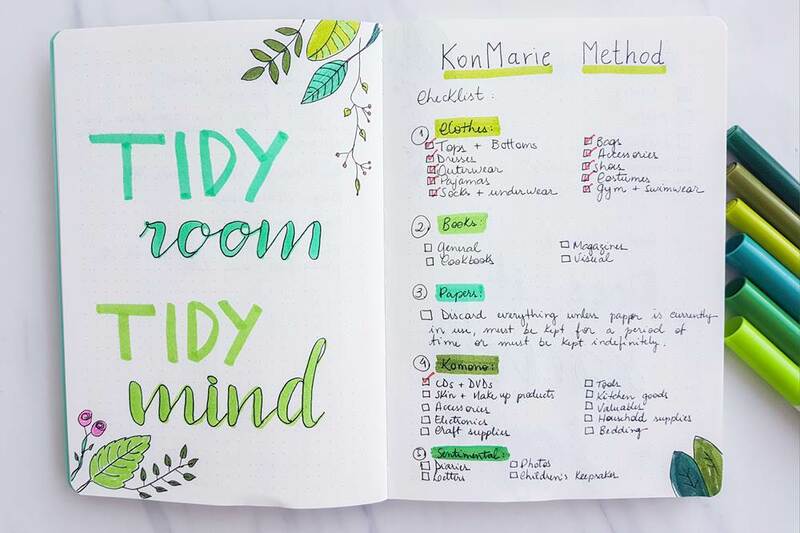 Using a KonMari Journal will assist you in applying the KonMari method for tidying and decluttering. It is a adaptation for a bullet journal declutter page. 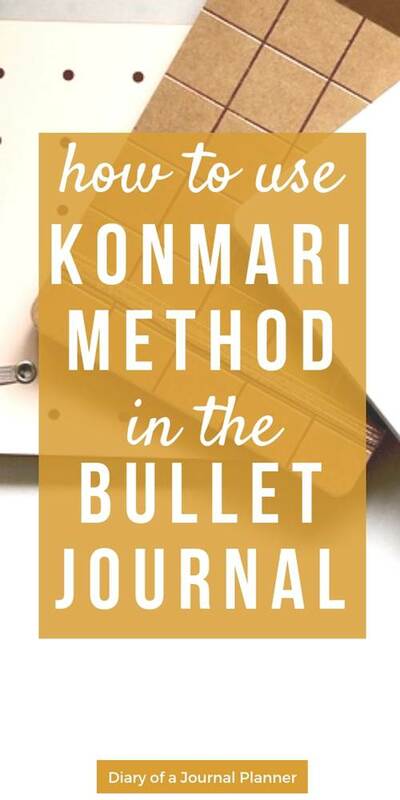 The Konmari bullet journal will help you figure out what you’re keeping or getting rid of, and creating a plan for the entire decluttering experience. As the book explains, there is an important order to tidying. First you discard the unnecessary items, then you organize the and store the remaining items. 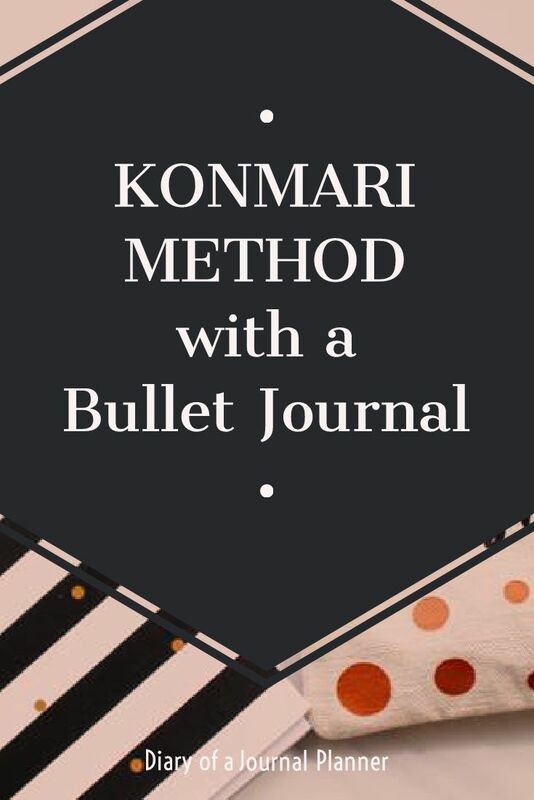 Below are a few tips and a Konmari checklist for bullet journal. 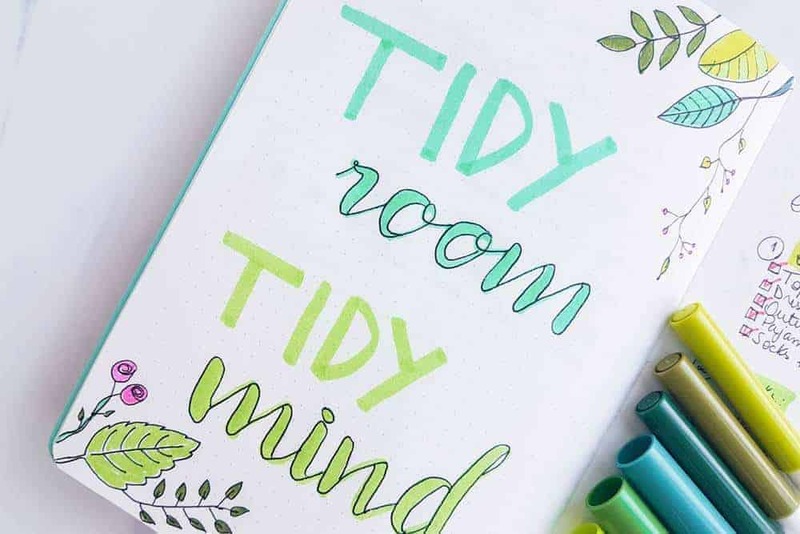 Here is how your bullet journal can help you get your life decluttered. The Konmari method checklist is just an easy tool to make sure you follow all the steps in the right Konmari order of decluttering! 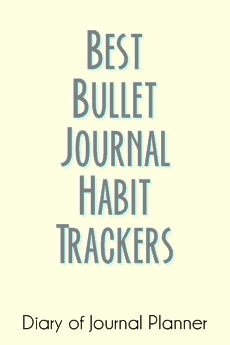 Ticking things off your bullet journal check list is always rewarding and will help you keep organized throughout the tasks. The entire decluttering process will likely be long and tiresome depending on how much you have to declutter, but it is totally worth it! However, having a Konmari decluttering checklist in hand will make sure that you don’t miss any steps or get ahead of yourself! I started by making a general list of my belongings, divided by category and following the authors order suggestion. This is where you start with decluttering. Right away, you will probably know which subcategory from clothing you need to declutter most. And then you can follow the categories in order. As you can see I started with clothing. The CD and DVD category is out of order but that is because I just moved and I did I huge clear up before moving so that part is done too. The next step is to find the joy in the items you have. 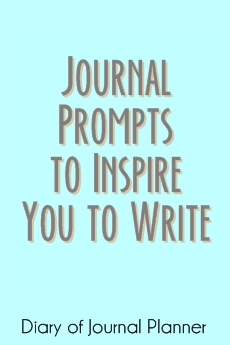 Go down the category list, bringing your journal with you as you pick up each item or touch it. When you look at it or pick up the item, you should feel a sense of joy and happiness. Does it bring up a happy memory? Do you feel more comforted knowing it is there? If so, keep the item. If not, get rid of it. Once you are done with the category you can check it off your Konmari list. As you follow your discard and storing process, cross off the categories once you have gone through all items of the Konmari category list or subcategory. I make a habit of also writing down any challenges I face though the decluttering process and also how long it took roughly. Next time I can check my Konmari bujo to have a better idea of how much time I need during my tidying up session. Marie Kondo’s book also suggests a folding method to help you store and find your belongings easily. 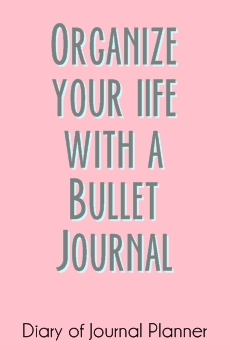 Once I have finished a category I write down in my bullet journal any organizational tip in my Marie Kondo bullet journal list for future reference. Have I learnt something that will make my tidying up easier? For instance, I am making an effort to store all tops (short, long or no sleeves) in the same space, regardless of the season, arranging them from heavy to light so I can see all of them at once. I noted down some folding tips in my checklist bullet journal page so I make a habit of doing it this way. In my journal I can also write down how letting go of stuff makes me feel. If I find something that I used to cherish once but now it doesn’t seem to spark joy as before, I also write down some words of gratitude for having had that item and how I am ready to part wit it. I know it requires practice and I hope it will become easier in the future but putting down my feelings also declutter my mind, just like a brain dump does. By the time you are finished you will feel lighter and accomplished. 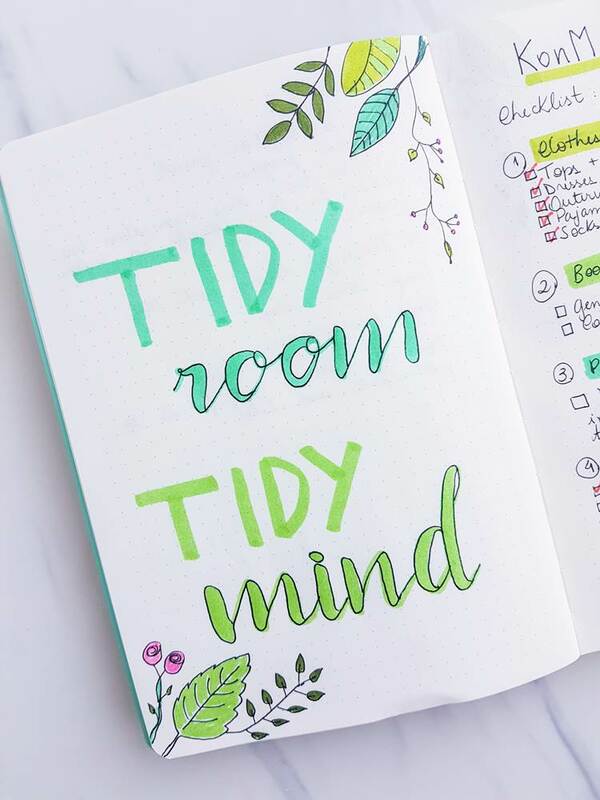 The next time you declutter your home will be a lot easier by having your lists and tips in your bullet journal. I created this Konmari checklist free printable based on my declutter bullet journal spread above, so feel free to print this if you don’t feel like doing it yourself! 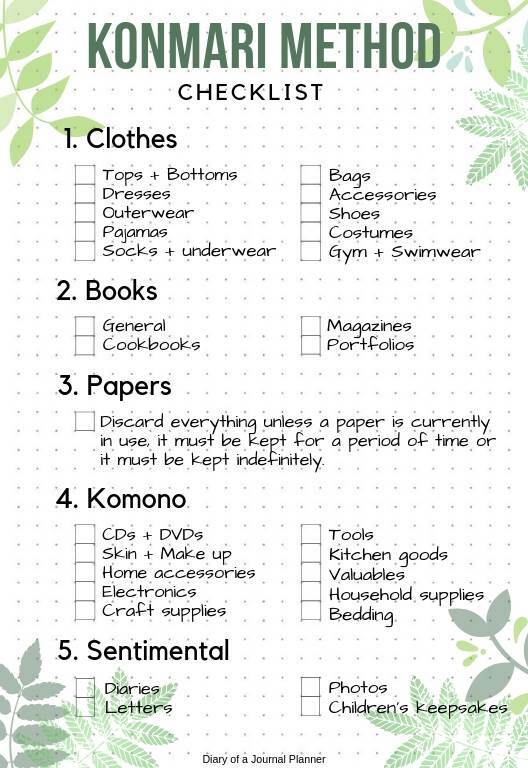 This is a simple print and go checklist for your Konmari planner. It is made to fit a A5 sized bullet journal notebook, but if your notebook is of a different size then just adjust your printing settings so the printed checklist fit your planner or journal. In this checklist you will find the Konmari categories in order so you can schedule your tidying and tackle one thing at a time. Click here to download the Konmari method pdf checklist. Do you follow the life changing magic of tidying up checklist too? Let me know your spread in comments below. The Konmari method must be like certain foods — dill pickles, cilantro etc. People either love it or can’t stand it! I love it and your bullet journal suggestions really hit the spot. Thanks. I guess one could say that Mandy, glad you enjoyed it! I’m quite new to Marie Kondo method but have been working on my home and have felt so much ‘lighter’ in everything. I lost my daughter 3 years ago and it’s now time to sort the remainder of her belongings. Using this method has helped me to make better choices and choices with meaning. Thank you. Oh, we are so sorry for your loss Heather. I can only imagine how hard that task will be. Sending lots of love and light to help you along.